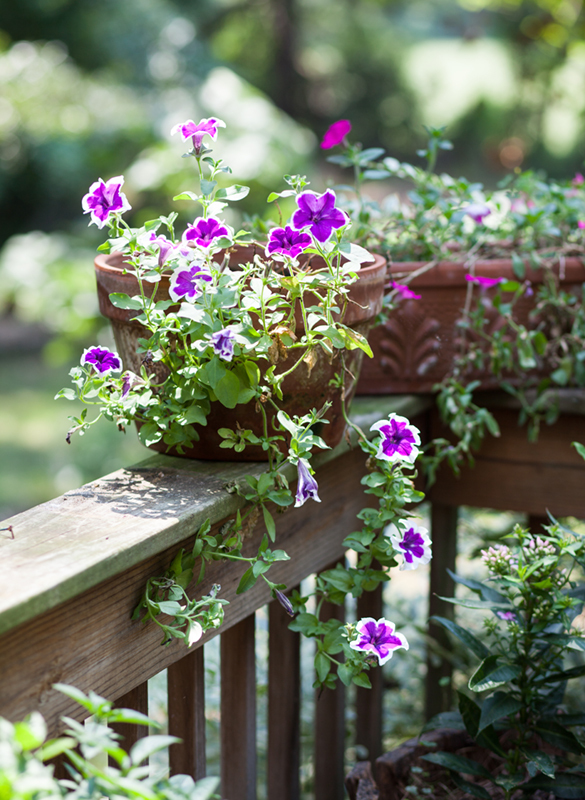 This year I tried a new Cascadia Petunia on the deck – Violet Skirt petunias from newgardenplants.com. This pot contains Violet Skirt grown from a cutting. As I removed one of the plants from the packaging in the spring, one of the stems broke off. I stripped the leaves from the lower section of stem and stuck it in a pot of dirt. It struggled for a couple months but never died. I’m thrilled that it is thriving now! If I was more diligent to deadhead it, there would be more blooms. It still looks lovely despite the neglect. For good instructions on rooting petunias from cuttings, check this site. Cascadias are my favorite petunias. They do well in hot weather but need water daily when the temp is in the upper 90’s. They quit flowering when it’s over 100 degrees but come back quickly when the temperatures drops. I usually get Cascadias from Spring Hill Nurseries. Spring Hill no longer sells the Choice White Cascadias alone. In years past, I planted Choice White with pink and coral geraniums in the planters. The waterfall of white is splendid over a balcony. This year, I wanted a change and the purple is gorgeous.